It's been a little while since I've highlighted a particular author. I rather enjoy doing it because I learn more about books, the industry and the people behind it when I do so. It's a lot of fun for me. 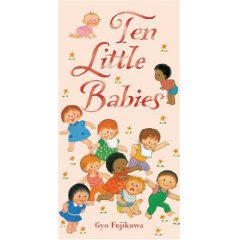 Recently I took notice of two board books that were written and illustrated by Gyo (pronounced "ghee-o") Fujikawa entitled Baby Animals and Ten Little Babies . They attracted my attention first and foremost because they were very reasonably priced board books that are shaped differently than most. They are roughly 9 1/2 inches long and 5 inches wide which makes them stand out from other board books. Furthermore, the illustrations were extremely dated which, having been recently republished by Sterling Publishing in 2008, they were intriguing to me. Both books are quite cute. Baby Animals , of course, focuses on animals and pictures the children interacting with them. Ten Little Babies has the babies disappearing one by one, the last becoming a grown-up "and then there were none." It's a very sweet and sentimental book that makes you want to curl up with your little ones and spend more time with them. 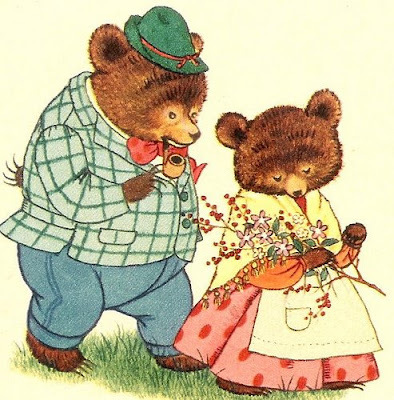 I couldn't date the illustrations in these books so I did some online hunting and discovered that Baby Animals appeared on the scene in 1963 and Ten Little Babies didn't come around until 1989. The illustrations are just so unique I had to learn more about the illustrator herself. 1. She was born in 1908 and died in 1998, making her a marvelous 90 years old. She was born to Japanese parents and named after a Chinese emperor that her father admired. 2. She was engaged to be married at age 19 but never married. 6. Ms. Fujikawa's family was interned in Arizona after the Attack on Pearl Harbor during World War II. 7. She was the first illustrator to include drawings of children from multiple ethnicities. Gyo Fujikawa certainly sounds like a fascinating woman to me. Her most popular books are Baby Animals and Babies which have sold more than 1.3 million copies combined. (Good thing she asked for royalties, hmm?) 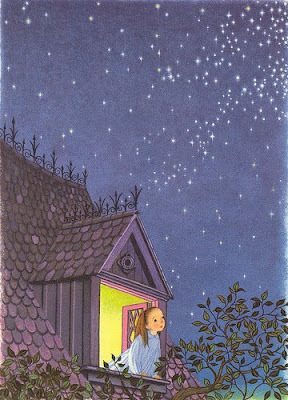 In browsing online at some of her illustrations, I came across the following which is so familiar to me although I cannot place the book it came from. Any guesses? So much of her work is familiar to me although I wouldn't have pegged it as being hers up until writing this post and taking a small period of time to get to know her better. 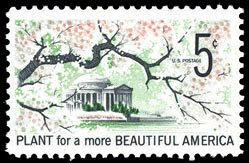 I must say that I appreciate her works more now as a piece of American literary history! When I saw Baby Animals and Ten Little Babies I thought that they would make perfect baby gifts and now I'm more convinced than ever! The history behind the books just makes them that much more intriguing. Check them out if you get a chance! They are quite uniquely beautiful. Thanks, Sterling, for keeping them around! Here are some final images to leave you with. Enjoy! I'm a little bit familiar with her books, but I've definitely learned something. Thanks for highlighting her! Thanks for this, Carrie. I'm so glad Sterling has republished those titles. Loved learning more about her. a tech question from a non-techie (so please give me the "For Dummies" answer): how do you get the beautiful pictures from the book onto your blog? Do you (basically) cut & paste them from another site, or do you take a photo and then transfer it digitally? WOW! I had that Baby Animal book when I was growing up. I have no idea where it is now though. Too cook! Thanks for posting. And I would have thought Gyo was a he, but I learned she's a she. 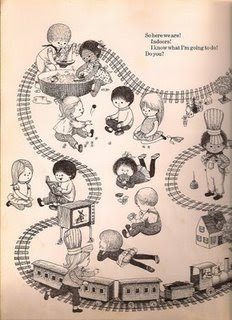 One of my most treasured books is a copy of A Child's Garden of Verses illustrated by Fujikawa. It is a gorgeous book; much lovelier than any other version I've seen. The train scene is from Oh! What A Busy Day. 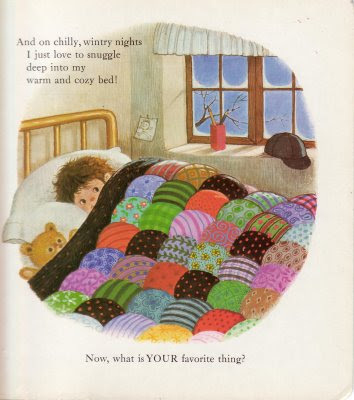 I have owned that book since I was about 7 or 8 years old, and her A to Z Picture Book. I learned how to draw from looking at her illustrations, and her style has influenced my own as an artist. She is definitely an under-appreciated tour de force in the literary world. I hope someone writes a big juicy biography about her, full of illustrations! Thanks for posting her info.